The status of Banbury as a centre of industrial railway interest has fallen progressively over the last twenty years. Most of the interest centred on the various ironstone quarries. Those associated with the Chipping Norton branch went first, and now the two quarries in the Woodford area have ceased work. Our present concern is with the two Woodford area casualties. 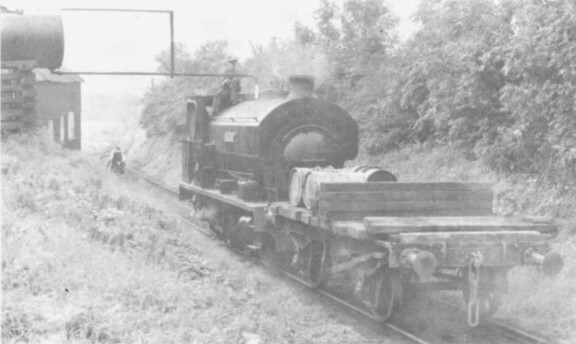 Both were of unique interest in their main-line connections as Byfield was the only working quarry served by the former Stratford-on-Avon & Midland Junction line, and Charwelton the only one on the former Greet Central Railway main line. One is tempted to look for a connection between these closures and the abandonment of the BR lines concerned. However, the days of the small quarry are numbered anyway, and both factors were probably significant. In the second week of May 1960 help arrived in the shape of a big Avonside from Staveley Works, similar to several at work in the Staveley Minerals group. She had cast brass plates on the tank, No.3 AVONSIDE, and was painted maroon on arrival, but in August 1960 was given a fresh coat of shiny black paint with red rods, motion and backing to the nameplate. Whilst this was being done, CHERWELL worked the traffic unaided; SIR BERKELEY does not appear to have worked again, and No.3 was back in traffic at the beginning of September 1960. 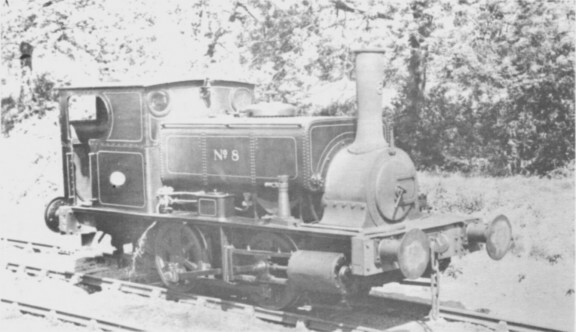 With both engines in service, there were four to six trips daily as required, the load being eight 27−tonners. One loco worked from the pit to the loop, and the other thence to the SMJ sidings. About March 1962 the forlorn Manning relic was hauled up to the quarry and dismantled by means of the excavator jib; the frame, wheels and saddle lay separately on the top of the quarry face, which had by then advanced to a mere field's width from the lane by Iron Cross, and accessible by a farm track. At the same time, the Hudswell Clarke was moved back to the buffer stops, where she kept company with the cab of the Manning Wardle. Trevor Riddle visited the quarry in June 1963, but the Manning remains had gone by then. Later in 1963, SIR BERKELEY was often put outside on the line near the shed; this was done when shed space was required for other purposes, according to Mr Pridmore, the Manager. Early in 1964 Roger Crombleholme, who had recently negotiated the purchase of the two Sproxton locos for use on the Kent & East Sussex Railway (see RECORD 5/6), made arrangements to obtain SIR BERKELEY for the same line; however, the KESR was experiencing some difficulties, financial and otherwise, and it was decided that the loco should go instead to the Keighley & Worth Valley Railway Preservation Society, as the latter would be able to use her more quickly. She left on 19th January 1965 by road, taking several days on the journey. On the author's visit on 21st January 1965, Hudswell Clarke 347 was still dumped near the buffer stops, almost complete apart from a few cab fittings. It had snowed hard the previous day and she looked a-picture with the winter sunshine glinting on the snow piled high on the saddle tank and drifted behind the chimney. Within days work on scrapping her had begun and on 3rd February Roger West reported her as half cut up. Work seems to have halted, for on 24th April Eric Hannan discovered the frame, cab and wheels down by the SMJ sidings. Just when these disappeared is not known, but they had gone by August. The closure appears to have been pretty sudden. It has been suggested too that in fact it precipitated the closure of the SMJ, to which it supplied the most important traffic. Whether this is so I cannot say; but earlier on it had been intended to repair the loco shed, the middle of the roof of which had been missing for two years. The rear part had been reroofed and the front part prepared - including a smoke chute believed to have been transferred from Sproxton. Other evidence of a hasty decision was provided at Iron Cross, where a long narrow half-completed gullet extended from the quarry face, evidently with the aim of extending the working area. No time was lost in dismantling the system, and the staff were kept on for some six months for this purpose. By the end of May the quarry line had been lifted but track remained from the loco shed to the SMJ line. Two months later all this had gone save a short length by the loco shed and loading bay sufficient to accommodate the two locos, and earth-moving equipment was busy levelling off the cuttings and embankments. 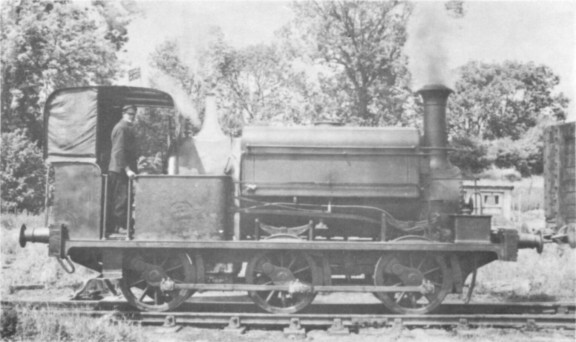 The locos soon lost their plates, and in this condition the Avonside was sent to Cranford on 10th September 1965. CHERWELL remained at Byfield for nearly a year longer but at last, on 11th August 1966 was taken by road to the New Street Recreation Ground, Daventry. According to the "Northampton Chronicle & Echo" of 29th July 1966 she was "given to Daventry at the request of the Surveyor's Department of the Borough Council to be used in the children's' play ground". The move was reported elsewhere in the press and by the BBC and there was "criticism from some irate mothers" according to Mr H.A. King of Stewarts & Lloyds Minerals Ltd! Three of the plates had been filched by unscrupulous collectors but Mr King states that one nameplate was salvaged and is to be reinstated on the loco, together with a brass plate giving details of the history of the engine. By this time dismantlement of the railway and restoration of the site had been almost completed with the thoroughness now customary in these operations. The cuttings and mounds of excavated earth have all been meticulously levelled off; the level crossing site and the route through the fields can just be detected by gaps in the hedges replaced by fences, but to the casual observer there is little evidence of the railway here, and it will be even less in years to come. The bridges under Iron Cross lane and by the weighbridge have been filled in, though the parapets of the former remain. The last quarry is a cornfield, and even the gullet mentioned above has been levelled; and I can confirm from careful examination that no traces of the Manning Wardle remain! At the lower end of the railway, the BR(SMJ) track has been lifted too, but ballast, bridge and cuttings are unaltered. The main quarry buildings survive, however - loco shed, office, stores, and the length of track whereon the locos stood. Whether these will also disappear is not known at the moment. Nevertheless, there are a few traces if you care to look for them. Half a century of human endeavour is not to be wiped out without trace even by modern bulldozers. Changes in the railway system at Byfield in recent years, as we have seen, largely centres on the locomotive stock, in particular the extraordinary way in which the derelict locos were moved around from site to site; the layout, except for the quarry face itself, was unchanged. With Charwelton the reverse was the case; the loco stock was unchanged until the inevitable scrapping, but a new quarrying area was opened. In 1959 both locos were working, one between pits and reversing point west of the shed, the other thence to the GC station yard; in 1960 one loco sufficed for the diminished traffic, each being used in turn three weeks at a time. Because of this reduced traffic, No.28 at Park Gate Steelworks (Barclay 1987 of 1930) which had been earmarked for Charwelton, did not arrive. Nevertheless an entirely new quarry south of the road and behind "Bromtrees" Farm was opened up in 1961, and the line to the old quarry lifted, apart from the length in the road at the level crossing. Hudswell Clarke 347 of 1892 - drawing by Roger West. On 18th November 1961 the tramway was closed "for an unknown duration" as being uneconomic at the current level of demand, and because the new quarry had proved less successful than hoped. The system remained in this moribund condition for eighteen months, and many visitors called to see the locos, which were said to be in good condition "in spite of having to share the shed with a flock of birds" as David Cox reported. In June 1963 track lifting commenced, and by October the locos stood in the ruins of their dismantled shed, on the only bit of track left beyond the. gate to the GC goods yard. They were cut up on the spot. Roger West visited the site on 1st December 1963 when No.8 (Yorkshire Engine Co. 784 of 1905) had been reduced to a heap of scrap, and No.5 (Bagnall 2659 of 1942) was in the process of being similarly treated. (Teddy Boston wanted to buy No.8 and arrived on the spot only hours after cutting up commenced! had they started with No.5 his quest would have been successful!) A dragline was in process of levelling cuttings, though the course of the line by the roadside could be discerned by the fences left in position. Some buildings remain at the site of the loco shed and the level crossing site is detectable by the difference in colour of the road surface and lack of hedges at this point. The sidings in the GC yard itself were removed in 1964. Thus expired two picturesque ironstone tramways of Northamptonshire. Of the two, the roadside Charwelton line was probably the more attractive, and the essentially limestone vegetation is always more pleasing than the clay flora, the character of the hedgerow changing dramatically as one passes from one side of Charwelton Hill to the other. Both these lines enhanced the rural scene.